Ulrich Turck will withdraw as Managing Director of Hans Turck GmbH & Co. KG on reaching the age of 67 on March 1, 2018. At the same time, Christian Pauli, so far Executive Vice President Finance, will be appointed as Managing Director by the advisory board of Turck Holding GmbH, alongside Christian Wolf. Together with Guido Frohnhaus, Managing Director of Werner Turck GmbH & Co. KG, Wolf and Pauli will also constitute the management board of Turck Holding. In accordance with the succession plan, responsibilities in the Turck Holding will be distributed among the three Managing Directors: Frohnhaus is responsible for the areas of manufacturing and development, Wolf is responsible for sales and marketing, and Pauli for finances, human resources and IT. Electrical graduated engineer Ulrich Turck started his professional career after completing his studies at the German Aerospace Center (DLR). 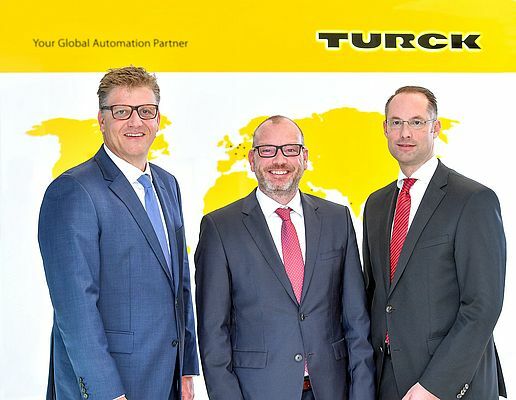 Having joined Turck in 1985, the son of company co-founder Hans Turck was initially responsible for the founding of Turck overseas subsidiaries in Eastern Europe and China. Since 1998, Ulrich Turck has been Managing Director of Hans Turck GmbH & Co. KG.